Image above is from Marion Bridge Radar captured 2016-12-01 @ 1:30pm. My name is Peter Ross. This is a video blog – my first. I have titled it: Sydney Dome. The title Sydney Dome is a bit of a misnomer for a curious weather feature that seems to be unique to Cape Breton. This video itself a series of screen captures from the Environment Canada weather radar in Marion Bridge during a large winter storm of March 21st, 2016. The coloured patch moving across the screen represents precipitation – in this case, snow fall. The changing colours indicate the intensity of that snowfall. Each frame in this sequence represents a 10 minute interval between 6:10am and 2:10pm on that day. I have seen the Sydney Dome in action numerous times. It seems to happen any time a large cyclonic storm, like a hurricane, or a post-hurricane, or a winter storm like this one, comes up the eastern seaboard and passes close to Cape Breton. If I was to show you the storm advancing over mainland Nova Scotia, you would see a solid storm front advancing across the province. Back in the first frame of this video, at the bottom left of the radar image, you might have noticed a small portion of the mainland, and the storm-front about to cross the Straight of Canso. But something funny happens here. When the storm arrives at Cape Breton, it seems to divide – with one arm going north, and the other going south. 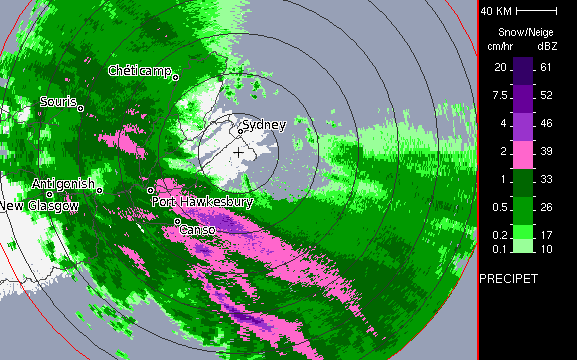 The center portion of the storm seems to stall as it encounters the Sydney Dome. And there, where the storm encounters the Sydney Dome, you can see that the intensity of the snowfall increases dramatically. And notice too how the snow-fall reaches right across Cabot Straight to Newfoundland, before it gets to Sydney, where I live. Cape Breton University engineering student, Connor MacDonald, is the one who coined the term “Sydney Dome” – because he said it looks like some sort of force field is sitting over top of Sydney, protecting it. I am going to run this animation two more times and speed it up. And while you are watching, there is a curious aspect to the Sydney Dome I would like you to consider. You will recall that cyclonic storms in the northern hemisphere turn counter-clockwise. In local parlance, these cyclonic storms are called Nor-easters. That’s because, even though these storms advance from the south-west – the wind and the snow are blowing in from the North East – the exact direction of that gap in the storm. So – while the Sydney Dome holds, it is overcast and windy in Sydney, but it’s not snowing. At least not for at first. When the snow does arrive, it accelerates to full blizzard conditions really quickly. Now I am not a meteorologist – so I am not sure what the Sydney Dome is or what it represents. But I am curious to know. So I invite viewers to offer their comments – and if there are any meteorologists out there who would like to weigh in on this, I would be really happy to hear from you. I have noticed this for years, calling it our "force field". I've often wished for a meteorologist's input to determine if it is a genuine phenomenon or just an artifact in the radar data. Thanks for sharing! I saw this yesterday as I watched the storm approach. I jokingly Tweeted about the unusual way the storm seemed to wrap around the Sydney area. I didn't know this was an actual weather event experienced here. I was surprised to see this post about it! 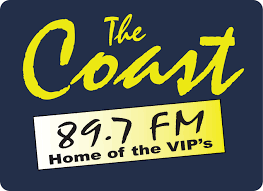 "ThisCape Breton Weather Watching: For the Naturally Curious" Bill Danielson Bill Danielson is a retired professor of meteorology who lives much of the year at Smelt Brook, on Cape Breton’s famous Cabot Trail. His passion for the Island and his interest and knowledge about the elements combine to make Weather Watching enjoyable, informative and understandable. Supported by stunning photographs of every imaginable weather phenomena familiar to us all, and diagrams that illustrate just how the weather works, Danielson brings Cape Breton’s natural history to life. is a great reference on what unique impacts we are affected by in Cape Breton weather.